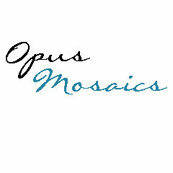 Creator of handcrafted, custom mosaic mirrors designed to clients' needs and tastes. 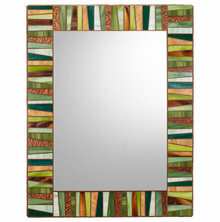 Options include a wide variety of standard styles, shapes, and sizes as well as completely original mirror designs. 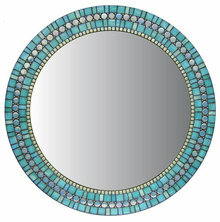 All mirrors are personally designed, crafted, and signed by mosaic artist Josh Hilzendeger. 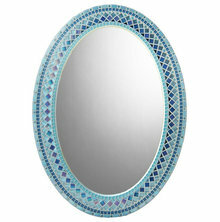 - Custom mosaic mirror design consultation and creation. - Free material samples to aid the design process. Based in Missoula, Montana; Shipping mirrors to the United States and beyond. Stunning piece! More beautiful "live" if you can imagine. Took a couple of months to receive but it was well worth the wait. Couldn't be more happy!! Excellent craftsmanship. This mirror is gorgeous. We just received our mirrors and I'm really happy with them. They look just like they did in the picture and it seems beautifully made. 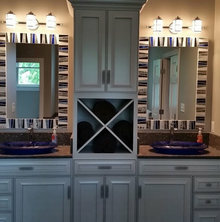 This is a BEAUTIFUL custom made mirror!